Patric Hornqvist scored a hat trick and added an assist, the Pens finally scored a power play goal, and Marc-Andre Fleury stopped all stopped all 30 shots he faced as the Pittsburgh Penguins shutout the Arizona Coyotes 6-0. Sidney Crosby had 3 assists, and Chris Kunitz, Kris Letang, and Matt Cullen also scored goals for the Penguins. The win pulled the Penguins to within 1 point of both the Detroit Red Wings and the New York Islanders for the 1st wild card and 3rd in the Metro Division, respectively. The quick 2 game home-stand gave the Pens a much needed 4 points before travelling to Washington to take on the NHL leading Capitals tomorrow night. It didn't take the Penguins long to get on the board in this one, and that first goal was all they needed on the night. Sidney Crosby shot the puck from the goal line, where it got caught up in a tangle of players and was lying in the crease. Patric Hornqvist managed to fight off his defender to poke the loose puck into the Arizona net to give the Pens the early 1-0 lead. Malkin managed to draw a slash midway through the period, but again the Penguins power play faltered, making it 18 straight opportunities without a goal. Not long after it was the Coyotes' turn for a power play as Derrick Pouliot was sent off for a cross check that sent Jordan Martinook awkwardly into the boards. Tom Kuhnhackl made things worse with an incredibly boneheaded penalty already down a man. Kuhnhackl took out goaltender Louis Domingue behind the Arizona net to give the Coyotes a 5-on-3 power play. It was a fairly bizarre sequence on the delayed penalty in which the Coyotes held onto the puck trying to score instead of taking an extended two man advantage by giving up the puck. And while they managed to get some chances, including a couple shots that rang off the iron, the Penguins were able to kill off the opportunity. The kill gave the Pens a chance to extend their lead before the end of the first intermission, and they took advantage when Patric Hornqvist scored his 2nd of the game with just over two minutes remaining in the 1st. Chris Kunitz wristed a shot towards the net, and it appeared to be tipped in quick succession by Martin Hanzal then Hornqvist before fluttering off Domingue's glove arm and into the net. A Carl Hagelin tripping penalty put the Coyotes back on the power play, but Pittsburgh was able to make it to the intermission with the 2-0 lead. The Coyotes started the 2nd period with 49 seconds left in their power play, but again they were unable to score. And neither were the Penguins after Sergei Plotnikov took a tripping penalty on his former teammate Ian Cole just minutes into the 2nd. The Penguins have looked primed to break out of their slump with Malkin back in the lineup, but they just couldn't get the monkey off their back. After killing off the Pittsburgh penalty, the Coyotes managed to get some good scoring chances but couldn't get the puck past Marc-Andre Fleury. 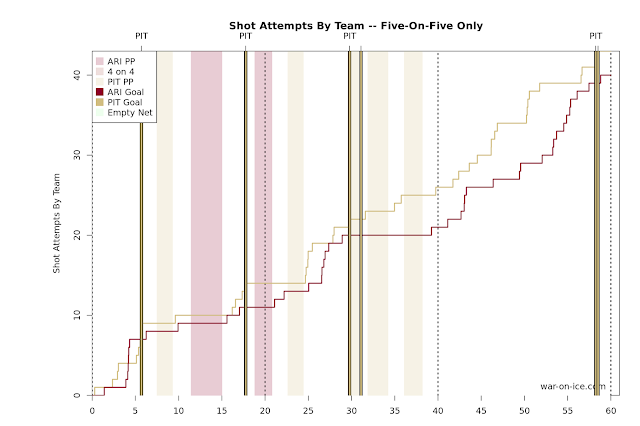 The Pens again took advantage of the Coyotes inability to score when Kunitz redirected a Kris Letang shot past Domingue. And with a delay of game penalty on Zbynek Michalek immediately after the goal the Penguins had a golden opportunity to put the game away. Sidney Crosby nearly broke the power play scoring drought himself, but he wasn't able to bat the puck out of the air off the rebound. But it was Patric Hornqvist's night, and after Evgeni Malkin dumped it off to wide open Hornqvist on the left circle it was one-timed into the empty net for the Swede's first career NHL hat trick. It was also the first goal for the Penguins on the man advantage in 20 chances, and it was a great individual effort by a player who was injured for the majority of those chances in Malkin to finally help the Pens breakthrough. The goal seemed to give the Penguins an extra jump in their step, and instead of sitting back in a shell they started taking it to the Coyotes. They managed to draw a pair of penalties, and though they didn't score they snuffed out the ability for Arizona to get a goal and some momentum heading into the 3rd period. Even if they had managed to score, it wouldn't have mattered tonight. The Penguins continued to drive the play even with a 4 goal advantage, and they managed to tack on another couple goals in the final two minutes. Letang sidestepped Martinook and blasted a shot that beat Domingue 5 hole, and after losing the faceoff, the Pens took the puck after the Coyotes dumped it in, and Domingue couldn't glove a Matt Cullen shot on the rush to push the Pens' advantage to 6-0. The Penguins didn't have the strongest start in the possession game, but they got stronger with each goal they scored and eventually came out on top with a score-adjusted 55.7 CF%. The addition of Evgeni Malkin came just in time for Pittsburgh as they played their 1st of 5 games in 7 days, and tomorrow night's game against the Capitals will kick off a stretch where the Penguins play 9 of 10 within the Metropolitan Division.